From December 1 - 3, 2016, Arredoclassic will attend the Myanbuild / Home & Office Fair at the Mida Ground Exhibition Hall, U Wisara Road in Yangon. 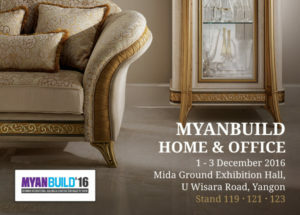 This Fair, located in the heart of the capital of Myanmar, is one of the most important construction and furnishing events in the whole ASEAN area: the 2015 Fair saw the participation of more than 350 exhibitors from over 20 countries (including USA, France, Italy, Germany, China), in an exhibition area of about 6,000 square meters (about 65,000 square feet). The stream of 6,500 professional visitors confirms the strong economic growth of the entire area. We look forward to welcoming you in our stand, where you can see our Liberty and Melodia Collections in an elegant setting. December 1 – 3, 2016, Mida Ground Exhibition Hall, U Wisara Road Yangon, Myanmar. Stand No. 119 - 121 - 123.